I can remember the first year that I discovered the Leapfrog Leappad learning tablet, and its Vtech competitor, the Innotab. I clearly remember the dismay, as a software developer, that neither kids tablet was running on a standard operating system. 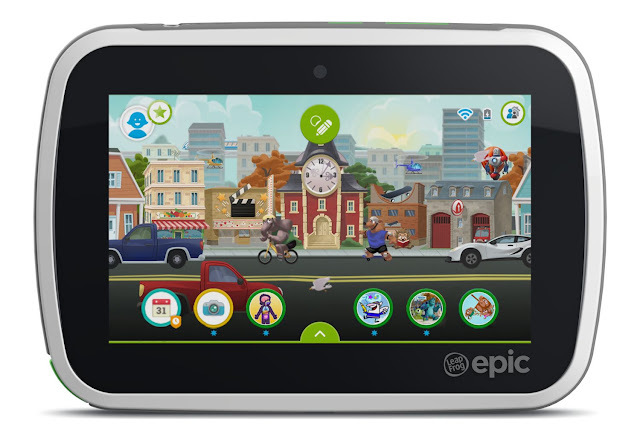 Last week I received the wonderful news that this year Leapfrog are launching the Leappad Epic, their first kids learning tablet to run on the Android operating system. Woo hoo. * Ability to draw upon industry expertise for app development; this should mean that the Leapfrog content is more diverse and cheaper to develop in the future. The Leapfrog Epic promises to "grow with your child" and I'm looking forward to trying out its promise of content that really adapts to your child's age and ability. Little things such as the ability to remove the chunky bumper around the outside of the device mean that the Leappad epic is the first Leappad that will really hold appeal for children from age 3 upto around 10 years old. With every release of the Leappad, the Leapsearch browser evolves and I shall be interested to see how it sits on the Android platform, and how flexible I find it for Lara who has an insatiable thirst for knowledge (far beyond the content currently available on her existing Leappad Ultra). As with all Leapfrog products, the Leappad epic is designed to encourage learning through play and the Leappad epic looks to be their most configurable, tailorable kids learning tablet to date. It has a quad core processor and a 7 inch touch screen. We CAN'T WAIT!! !